World BPA Production Grew by Over 372,000 Tonnes in 2012 | Merchant Research & Consulting, Ltd. 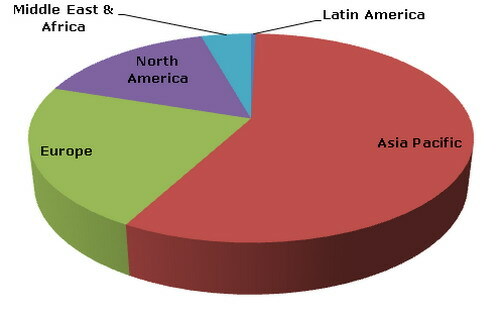 In 2011, the global bisphenol A (BPA) production recorded 5.25% YoY growth and reached approximately 4.4 million tonnes. In 2012, it grew by just over 372,000 tonnes if compared to the previous year and surpassed the 4.6 million tonnes mark. Meanwhile, the global operating rate of the BPA production was at the 80% level. Asia is the dominant BPA manufacturer with nearly 53% share of the overall production volume, which is equal to slightly over 2.4 million tonnes. It is followed by Europe and North America, holding 25% and 18% market shares, respectively. The USA, Taiwan, China, South Korea and Japan are the top five BPA producers worldwide. In 2012, their combined contribution to the world BPA production volume was more than 2.7 million tonnes. Bayer, Sabic Innovative Plastics, Nan Ya Plastics Corp, LG Chem Co, Mitsui Chemicals Inc, Kumho P&B Chemicals Inc (KPB), Momentive Specialty Chemicals Inc, Dow, Chang Chun Plastics Co, Saudi Kayan Petrochemical Co, PTT Phenol Co, Samyang Innochem, Sinopec Mitsubishi Chemical Polycarbonate (Beijing) Co and Blue Star Co are among the leading companies active in the global BPA space. As of 2013, global annual production capacity of BPA stands at more than 6.2 million tonnes. Asia Pacific captures just over 57.5% share of the global capacity, which is equal to over 3.58 million tonnes. 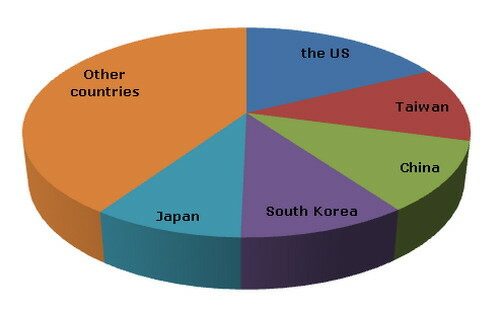 The USA, South Korea, Taiwan, China and Japan are the top five countries in terms of annual production capacity of BPA. Asia-Pacific is the leading BPA consumer, accounting for over half of the global consumption volume. The BPA market is highly dependent on the overall economic environment as the product’s derivatives are mainly used in such end-use sectors as construction, electronic and automotive industries. Around 70% of the global BPA supply volume is used in polycarbonates’ production. Epoxy resins industry is another important BPA application area. In 2011, the value of foreign trade in BPA exceeded USD 2.45 billion. The global BPA market is poised to experience stable growth in the years to come, mainly driven by the increasing demand for the product in tandem with planned BPA capacity additions. Worldwide BPA production is expected to go beyond 5.4 million tonnes by 2015. More information on the BPA market can be found in the report “Bisphenol A (BPA) 2013 World Market Outlook and Forecast up to 2017”.